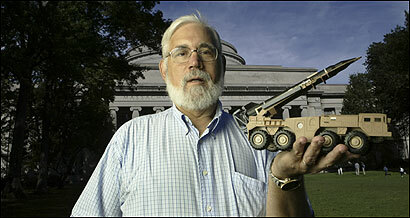 After the Gulf War, MIT'S Ted Postol challenged the Pentagon and won. Now missile defense again has pitted him against the government - and his employer and colleagues. The office is cluttered even by the standards of office clutter at the Massachusetts Institute of Technology, which fall somewhere between a toddler's playpen and post-Agamemnon Troy. Balding and bearded and dressed in shorts and a knit shirt, Theodore Postol sits behind a desk piled high with stacks of memos, government reports, and thick binders. Somewhere within these mountains of paper hides the quarry he's been pursuing for more than 20 years. "The real world," says Postol, a professor of science, technology, and national security policy, "is often choosing between evils." For 15 years now, Postol has been the leading scientific critic of missile defense, which endeavors to shoot an enemy's long-range missiles out of the sky. It is Postol's opinion that the idea did not work when Ronald Reagan proposed it in 1983, does not work now, and will not work in the conceivable future, and he neither minces words nor suffers fools gladly. In the latter category, he has come to include not only the advocates of missile defense but also the highest administrators at MIT, who Postol says have conspired to cover up "fraud" in the testing of missile defense in order to maintain a lucrative relationship with the country's defense establishment. MIT's Lincoln Laboratory received more than $70 million this year from the Missile Defense Agency for work on missile defense. Postol has accused researchers at the facility of being complicit in fudging a report on a missile defense test in 1998. And he has charged that MIT is covering up the coverup. The dispute's final layer is Postol's claim that MIT retaliated against him by removing him from the institute's Security Studies Program, by increasing his program's overhead costs, and by attempting to move him to offices outside the MIT campus. There is no DMZ in Postol's vocabulary. He talks about "fraud" and about colleagues who "betrayed" him. He calls Susan Hockfield, the new president of MIT, the "Enron CEO" because she declined to see evidence that Postol tried to present in defense of his claims. "She wants deniability so she refuses to accept what she wants," Postol fumes. "She's the CEO of this corporation. What is this, Ken Lay? Jeffrey Skilling? That's the Ken Lay defense, and I find that immoral." Postol is even less cordial about Hockfield's predecessor, Charles Vest. Vest would not comment directly for this article, and Hockfield only replied in a brief e-mail, saying, "MIT responded to Professor Postol's charge by following established procedures and conducted a preliminary inquiry, which concluded that a further investigation was necessary. The investigation needs access to classified information, and that's been the problem." To his credit, Postol has taken aim at a very big fish in a very small barrel. For two decades now, billions of dollars have been poured into missile defense. And, yet, the basic problem - hitting an incoming missile - still seems beyond any solution. The last two tests, conducted over the Pacific in December and February, failed when the rocket that was supposed to knock down an incoming nuclear missile didn't leave its silo. Cost: $85 million each. "Missile defense is ultimately an immoral thing to do," Postol says. It's like telling people, `Go walk over that bridge,' when you know it's likely to collapse." It would be easy to dismiss Postol as an eccentric loudmouth, if not for one thing. Postol was right once before. In 1991, the aftermath of the first Gulf War, the Patriot missile system was a technological star. Army officials claimed that the system, built by Raytheon Co. of Lexington, had intercepted 45 of the 47 Iraqi Scud missiles at which it had been fired. Proponents of missile defense cited the Patriot as proof of the efficacy of antimissile missiles, so much so that Congress increased the budget of the missile defense program that year substantially. But when Postol studied the video footage of the Patriot-Scud engagments, he concluded that the Patriot had destroyed not a one. The Pentagon was outraged, going so far as to classify the article in which Postol presented his case. Raytheon officials accused him of tinkering with the video footage. Ultimately, Postol's work was vindicated. "In those early days, he was pretty much alone," says Philip Coyle, the senior adviser to the Center for Defense Information, a Washington-based policy group that advocates for increased oversight of defense spending, and a former assistant secretary of defense. "I think institutions make a serious mistake when they underestimate his tenacity. Most people, even when they know they're right, give up long before Postol does. I don't know if he's ever given up." Since then, he's carried his campaign against the Patriot into his current opposition to missile defense. He has carried the doggedness that sustained it into his fight with MIT. "I'm not some clown off the street," he says. "I've been right every time I've made an assertion in public." Postol sees fraud at the heart of the program, as well as wide-ranging ancillary frauds, in which he maintains MIT has become a willing partner. The missile defense program was born 22 years ago as an evanescent vision - part George Patton, part George Lucas. It's not much more real today. So far, the dispute at MIT has spanned two years, several internal investigations, and one heart attack for Postol. He goes on, blowing his whistle in every direction. On March 23, 1983, Ronald Reagan went on TV. He told the country why he had spent the previous two years building up the country's nuclear arsenal: to counter what he called a growing threat from the Soviet Union. Then, halfway through the speech, Reagan invited the country's scientific community to join him in a quest to render nuclear missiles obsolete by developing defensive weapons that would knock them out of the sky before they could do their terrible damage. Over time, the program has envisioned many exotic technologies: 100-ton space-based lasers, neutral particle beams, electromagnetic rail guns. In her history of missile defense, Way Out There in the Blue, author Frances FitzGerald reports that at least the germ of the idea may have come to Reagan out of a 1940 spy film called Murder in the Air, in which Reagan portrayed a secret agent in charge of something called an "Inertia Projector," a device capable of knocking down enemy aircraft. Throughout, missile defense had a shiny technological patina to it, consonant with other great American leaps forward like the Manhattan Project or the Apollo program. It's more than 20 years on now, and the shine is off. The threat against which Reagan proposed to array his system was crumbling into its component parts six years after his speech. Reagan's Strategic Defense Initiative ("Star Wars" to its critics) is now simply National Missile Defense. The effort has cost $92.5 billion, and its cost is still going up, which is more than can be said of its rockets. According to federal budget figures, the Department of Defense will spend $68.5 billion on missile defense from 2005 through 2011. But with past spending came serious accusations of fraud and mismanagement; whistle-blowers have sued aerospace contractors Boeing Corp. and TRW Inc., charging they falsified data, and a Pentagon review of cost overruns and delays, which is expected to be released next month, reflects what the review's chairman called, in a July interview with The Washington Post, "a conspiracy of hope." The goal is no longer to counter a torrent of missiles from another superpower. In December 2002, President Bush ordered the Pentagon to implement a more modest system by 2004, one meant to defend the country against attack from a rogue country such as North Korea or from terrorists who somehow get their hands on an intercontinental ballistic missile. Even the scaled-down version of missile defense is plagued with problems, and the 2004 deadline has come and gone. "I look at where SDI was, what they claimed it could do in 1983, and where we are now and what they're claiming," Postol says. "Now, you have the director of the program who says, well, I think we could have a greater than zero chance of intercepting something if we had to try. That's a pretty weak statement." Ted Postol trained at MIT as a nuclear engineer, leaving in 1975 to work at a government facility in Illinois and then, in 1980, joining the Office of Technology Assessment, which advised Congress. He moved on to the Pentagon, where he advised the chief of Naval Operations. Thoroughly civilian in 1982, Postol enjoyed the Pentagon. "When I went into the Department of Defense, I knew I was basically different politically from most of the people there," he recalls, "but the feeling that I had was that there were a lot of people I fundamentally disagreed with, but who were serious, honest people doing good work for God and country." Then, in 1983, Reagan got up and talked about a world made safe from the fire in the sky. Postol saw how Reagan's vision galvanized the Pentagon. Hard-bitten warriors suddenly were overwhelmed by what seemed to him magical thinking. "I saw all kinds of people running around, repeating this mantra - that we were going to defend people, not avenge them," Postol says. "I thought these guys would look at this and say, `Well, this is a great idea but we have no hope of doing this.' Instead, people were just jumping around." From the start, missile defense represented more than simply a formidable scientific undertaking. It also represented a utopian vision and a political litmus test. Whether it flew or not, missile defense was a handy way to demonstrate that one was dedicated to protecting the country, and one's political opponents were not. "I certainly have faith in the United States scientific community if [the problems] are truly technical problems," argues Baker Spring, a research fellow in national security policy at the conservative Washington think tank The Heritage Foundation. Spring says that skeptics are motivated by politics, not science. "You can't do this from the perspective of only the perfect is acceptable. I believe missile defense was the intended victim of a policy that says there is no answer to nuclear weapons with ballistic missile delivery systems, nor should there be because the search for the answer is so destabilizing as to make it dangerous. What we have seen in the history of arms control since then is what I would refer to as essentially arms control as frontal lobotomy. What they try to do is limit the ability of the human mind to produce new and better capabilities in military weapons." Spring outlines the case for missile defense in a 2004 Heritage Report, which even cites the Patriot. While its record in the Gulf War was imperfect, Spring wrote, "nevertheless, the Patriot defenses served to keep Israel out of the war and blocked the Iraqi government's attempt to use missile strikes against Israel as a means for splitting the coalition that opposed it." In other words, missile defense doesn't have to work to work. On June 24, 1997, a missile-interceptor rocketed into space from Kwajalein Island, an atoll in the central Pacific. To test whether an onboard sensor could distinguish between missiles and decoys, the "exoatmospheric kill vehicle" tracked a phony warhead launched from Vandenberg Air Force Base in California. The test was hailed as a success by the Pentagon and TRW, the Cleveland defense contractor that analyzed the test data. But analysts, including a former TRW employee, subsequently stated that the data had been cooked to achieve the desired result, prompting an investigation, and then another. The latter report exonerated TRW, but the scientists disputing the data took their fight to Congress. Then Ted Postol got wind of it. Postol agreed with the analysts and described the problem in a letter to the Clinton White House. Whereupon, just as it did in the controversy over the Patriot, the Pentagon classified both the report and Postol's letter. Postol also brought his concerns to Vest, MIT's president at the time, because researchers at Lincoln Lab were involved in the report that Postol considered dubious. MIT launched an inquiry, which led to an investigation. "In this case," says Claude Canizares, the associate provost who's overseeing the probe, "the Department of Defense did not want us to conduct the investigation we requested. At that point, we have to go to plan B - which is working with them, which is the direction we're going. It's not settled yet." Postol's limited patience was at an end. He accused MIT of conspiring to hide the data to protect the federal money flowing into Lincoln and MIT. His colleagues maintain that he was often loud and abusive. "Ted is in a state of perpetual war," says Richard Samuels, the director of MIT's Center for International Studies, home of the Security Studies program. "And he really demands and expects everybody to be shoulder to shoulder with him. The problem is that, if Ted senses that someone's not 100 percent willing to go to the mat with him, he begins questioning their integrity." One incident particularly rankled Samuels. In an e-mail dated August 18, 2003, Postol wrote of Samuels and another MIT administrator: "By aiding the front office, as they both have done, they are no less culpable in their actions than the bishops who worked with Cardinal Law to conceal criminal acts of pedophilia." "Give me a break," Samuels says. "That's not the way you deal with colleagues." Last summer, by a faculty vote, Postol was asked to leave the Security Studies department. "I've spent all of my time the last two years defending myself from slander against me by administrators, including my former colleagues here," Postol says. "There's a coordinated campaign around here to make me look like a nutcase." Meanwhile, the allegations concerning the 1997 test and the ensuing investigation are still unresolved. There is a chance - and, given his track record, a good one - that Postol will be proved right. He has gathered reams of supporting documentation through the Freedom of Information Act, and he claims he can prove his case without resorting to the use of classified information. That's a big part of the clutter in his office. By early November, he'll get a new one, and on the MIT campus, too, despite what Postol calls a retaliatory attempt to move him off campus. "That's a win, I guess," he says. "If you consider two years of fighting and a heart attack a win." Blow a whistle, his story says, and you never know what you might wake up. 1983 President Ronald Reagan announces the Strategic Defense Initiative, an effort to build a national missile defense. 1991 After the first Gulf War, the Patriot anti-missile system is credited with shooting down 45 of 47 Iraqi Scuds. 1997 A test of the missile defense system is hailed as a success. But critics contend that a contractor, TRW Inc., fudged the results. 1998 New report exonerates TRW. 2002 President Bush orders the Pentagon to deploy a limited missile defense system by fall 2004. 2005 Latest test of missile defense system fails when missile interceptor does not launch. 1989 Postol arrives at MIT. 1992 Postol testifies before Congress that the Patriot system was much less effective than claimed. 2000 Postol invites dissenting scientists to MIT and sends a letter to the White House, charging a cover up of fraud in the 1997 test. The Pentagon classifies Postol's letter. 2001 Postol accuses MIT's Lincoln Laboratory of scientific fraud for helping to produce the 1998 report. 2003 MIT commissions an investigation into Postol's accusations. 2004 MIT says that it cannot complete the probe because the relevant data is classified. Later, Postol is asked to leave MIT's Security Studies Program.